As with any wireless product there are some environments where this product will not function. To avoid frustration for consumers and guaranteed returns for Perimeter Technologies we would like to describe these environmental conditions as best we can. Includes Battery Charger which is built-in the Transmitter - Base Smart Station. Simply place a rechargeable battery in the Collar, and one in the Transmitter - Base Smart Station. The Base Smart Station monitors the Charge level of the Battery in the Collar. When the battery in the collar gets low, simply take the Fully Charged Battery from the Base Smart Station and replace the battery in the collar. No Need for High Cost of replacement Batteries. Battery charge is within 3 - 4 hours.While one of the 2 Free Rechargeable Lithium Batteries in the Smart Base Station, when it is fully charged it will act as a battery backup for 8 hours should the house hold power go out. This safety feature allows for continual safe operation and containment of your dog. How It Works: The Wi-Fi Collar Transceiver is the Most Advanced collar available. It is extremely small at 2.5" in width, 1.5" in tall and only 1.25" deep. It only weighs an astonishingly small 2.3 ounces, yet is packed with the most advanced electronics ever. The Wi-Fi Collar Transceiver offers more customized options than any other collar. The collar can be pre set at one of 4 static settings, and then setting 5 which offers Progressive Correction. When approaching the preset boundary the collar emits a warning tone. If your dog continues to approach the boundary the pre set correction level will be triggered. If you have selected setting 5 then Progressive Correction will be triggered. Progressive Correction starts at the lowest level then if your dog continues toward the boundary the internal micro chip will continually increase the correction level based on the speed your dog is approaching the boundary and the distance your dog is away from the boundary. This calculated increase in correction offers the utmost deterrent to your dog leaving the safe containment area, providing you peace of mind. Remember, unlike any other system, you can monitor this from your Smart Wi-Fi Base Station. Remember each collar can be independently programmed to allow you to customize your system for the temperament of each dog. Should your dog leave the Safe Zone the Correction will halt after 30 seconds. It's not just wireless. It's Wi-Fi. It's not just the evolution of the dog fence, it's a quantum leap. Past wireless fence systems there was the burden of laying out the perimeter of the fence and the hassles of burying the wire border. Users of this type of system know what it is like for the wire to break in the occasional gardening accident. 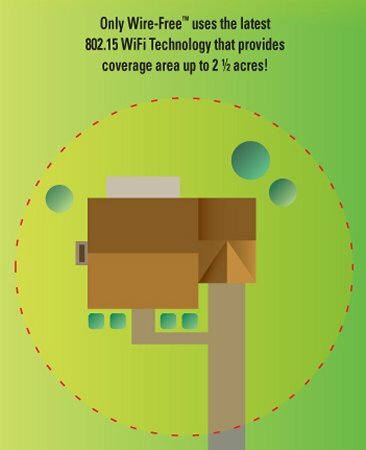 The WIFI Rechargeable Dog Fence System eliminates any use of a border wire and has a range of 2 1/2 acres. This Wire-Free Dog Fence is totally portable! You can take it with you while visiting friend and family. Just think of the less hassles when you move into another home. Your WIFI r rechargeable dog fence can be up in running in minutes compared to the weekend project with other wireless systems. The Perimeter WIFI Rechargeable Dog Fence System is the only Dog Fence you will ever need.